It’s quite possible you’ve seen these before. Tragic Mansions is the name of a novel by Belle Epoque socialite and iconoclast, Rita de Acosta Lydig. What started out as curiosity turned into an epic quest, and after more than a decade of searching for the book, I finally found a copy for…$1600. * For all I know, the book is terrible. I just want to read it because the woman had great taste in shoes and a very melodramatic life. Basically, this is a tribute to a story I will probably never read. In keeping with the general theme of tragedy, please note that there is a flaw in the arched window (edited out of the larger screenshot) which consists of a couple of very small but very bright red dots on the top of the arch, as shown. I had hoped this was something I’d done, but it must be a problem with the mesh since all the originals have the same red dots. I didn’t notice until I was editing my screenshots, so I don’t think most people will find the flaw intolerable, but I thought I should give fair warning. 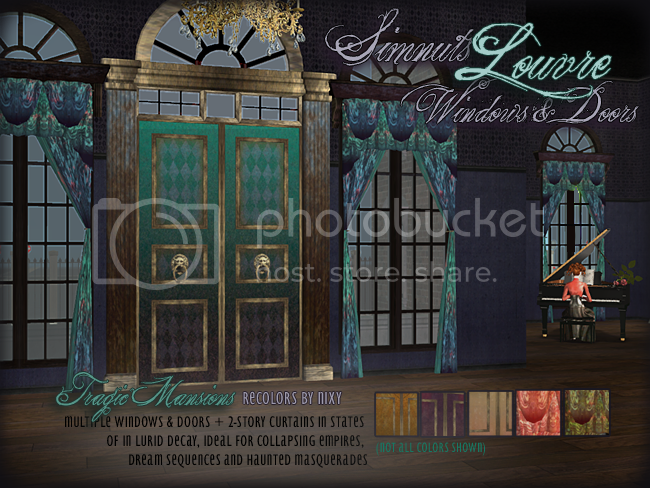 And because lurid double-height doors deserve–require, even–lurid double-height wallpaper, I made a batch. Yet more tragedy: After making three basically identical versions of these walls and testing them in game, I have been unsuccessful in making them completely seamless. The seam is not hideously bad, I guess, but it’s not perfect by any means. I will very likely be making 1-story versions of these at some point, so if you have any color or pattern suggestions or requests, I’d be happy to consider them for the next batch. *After an extended break from my quest, an online search last week dug up copies in the comparative bargain range of $300-350. I tell myself my upper limit is $50, but if I ever see the damn thing for $100 or less, it’s mine. 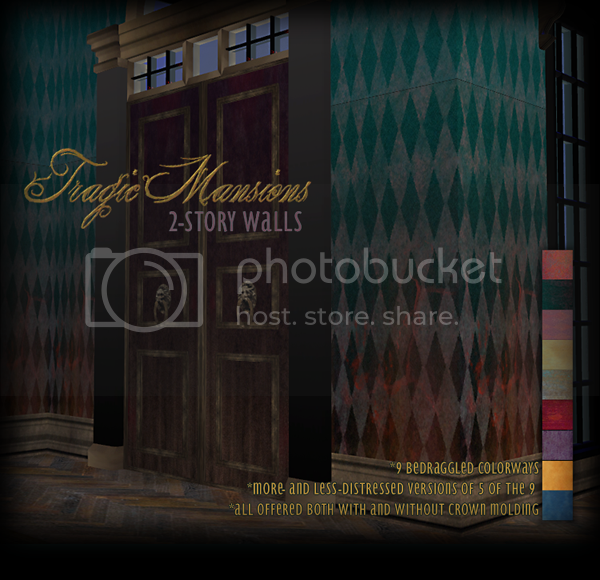 Posted in: build recolors, downloads, tragic mansions, Uncategorized, walls+floors.